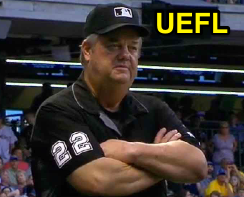 In June, MLB umpire Joe West was struck with a baseball thrown from the stands at Miller Park. New documents in Milwaukee suggest two things: the assault was a deliberate act and police know who the suspects are. A recently released search warrant paints the picture: According to a witness sitting along the foul-territory grandstand along the right field line in Miller Park, two fans nearby were not happy with West, allegedly shouting profanity and saying, "ump, you're going to cost us the game." The Marlins-Brewers game was tied at zero in the bottom of the 4th inning at the time of the incident. Related Post: Assault - Joe West Hit in Head by Ball Thrown From Stands (6/30/17). 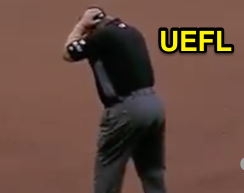 Joe West was hit by a thrown ball in June. The witness later observed a then-unknown projectile fly over his shoulder and down onto the playing field, where it struck West. In addition to his statement, the witness provided local police with a photograph he had taken on his phone during the game, in which the two unhappy fans were in the background: police identified the men as brothers in their 20s, arresting the siblings in August. According to case files, one of the brothers denied involvement, while the other brother claimed a friend could prove it was not him. On cue, the second brother's friend provided an alibi or excuse before eventually recanting and telling the police that he believed the suspect had, in fact, committed the assaultive offense. Meanwhile, the suspects' mother visited her sons in jail, asking one in a recorded conversation, "Did you admit to doing this?" Upon the suspect's response of, "No. I maintained I did not," she cut him off and stated, "All I wanted to hear. Stop talking." Police hope new evidence will prompt charges. Unfortunately for most newsreaders, including Brad Ziegler, who tweeted, "I hope they file assault charges for whoever just hit Joe West with the baseball," police were unable to charge the brothers with the crime over the summer due to lack of definitive evidence to indicate which suspect threw the baseball that hit West, and, thus, the men are out of jail...for now. The Milwaukee Police Department and Milwaukee County District Attorney's Office are hoping that new evidence will come out of a newly-filed search warrant to cover deleted Facebook messages and purchase history, which may indicate whether the baseball held in evidence was bought by one of the brothers.